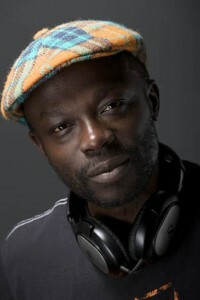 Peter Adjaye aka AJ Kwame has been involved in the music scene as a composer, musician, DJ, promoter and recording artist for over 20 years. His wide-ranging musical abilities gave start to the visionary outfit RPM (or Revolution Per Minute) on Mo Wax imprint. He formed Runaways (cover artwork by Chris Ofili) and also co-founded Ultimate Dilemma recordings. He has performed live all over the world and continues to do so from the USA to Australia and the whole of Europe. Founder of Afri-kokoa arts and music platform for contemporary influenced live events and promotion. Musical taste, technical expertise and a massive library collection of rare records and highbrow sounds have proved to be the perfect recipe for Peter. His musical diversity and natural flare has brought him to work closely with his brother the world renowned award winning architect David Adjaye OBE composing music for Adjaye Associates projects, films, lectures and installations. Including soundscape design for the Nobel Peace Centre, Oslo and collaborative installations including ‘Aysmmetric Chamber’ ‘Horizon Pavillion’ and ‘Genesis Pavillion’. He previewed his ever evolving project ‘Music For Architecture’ at ‘Musicity’ at the Architecture Foundation, alongside David Adjaye OBE, Dr Michael Bull and Paul Morley. After much research Peter unveiled his new collaborative project with his brother David entitled ‘African Metropolitan Music ‘, a unique compilation album and study alongside the release of David’s book and study ‘Adjaye Africa Architecture’ on Thames Hudson in UK and ‘African Metropolitan Architecture’ in US with talks at Rough Trade, St Martins Art college in Kings Cross (launch of new location) and in Miami at DesignMiami. Peter along with his brother David have been interviewed for the issue of ‘Songlines’ in October 2012, choosing 5 tracks for the cover CD. He recently completed a 7:1 surround soundscape design and architecture installation with Adjaye Associates for the Tate Modern ‘HyerLink Festival’ celebrating the Lichtenstein Exhibition 2013 in the East Tanks with a live interactive workshop that had over 1000 people attending thoughout the day. 2014 sees him working on a sound installation for INIVA(London), ‘Interni’ at Design Week in Milan plus a unique live soundscape performance with 5 musicians and talk with David Adjaye at British School of Rome followed by the same performance talk at the Royal College of Art in London in April and May respectively. Peter is sponsored by Bowers&Wilkins.